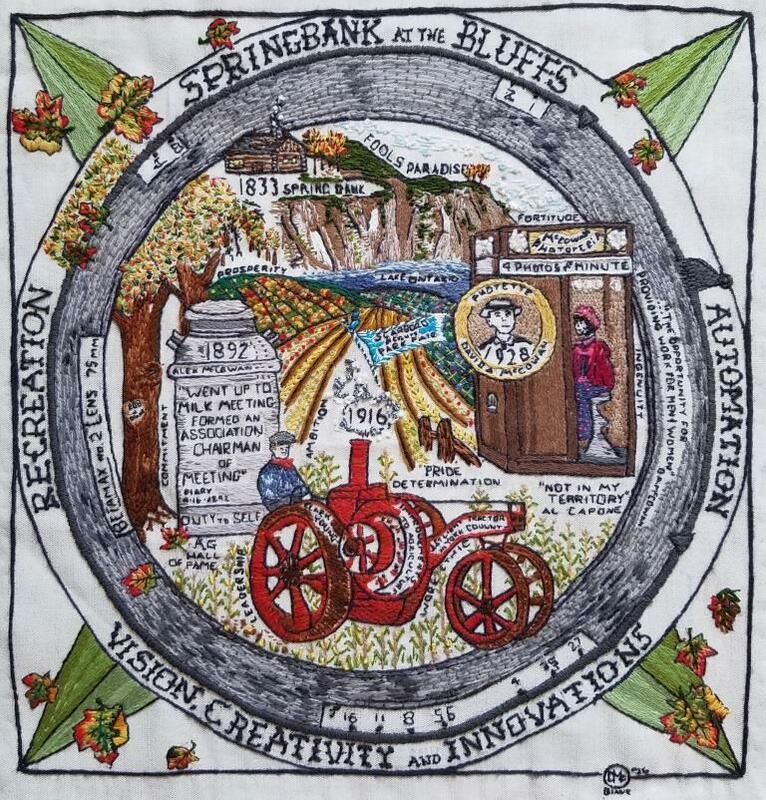 The September 2016 Scarborough Exhibition of the 305-panel Scottish Diaspora Tapestry was definitely unique. 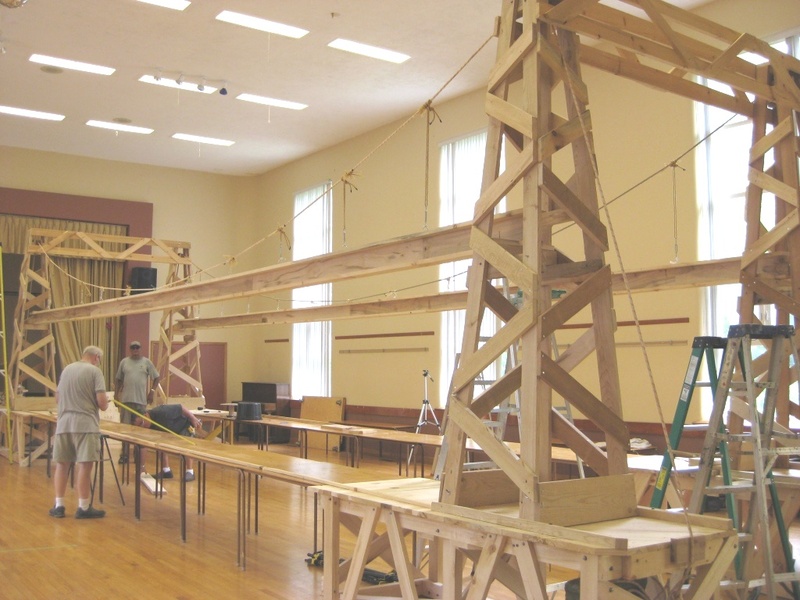 In the Thomas Telford Engineering Challenge, senior high school student teams were invited to design a thirty-six-foot long model of the central unsupported span of the Menai Suspension Bridge by which the entire Tapestry could (theoretically!) be hung at the Scarborough Exhibition. The Menai bridge – arguably the world’s first modern suspension bridge -- was designed by Scottish civil engineer Thomas Telford (ca 1820). Telford had apprenticed as a stone mason in Dumfriesshire, Scotland, alongside the Thomson brothers who later settled in Scarborough. The Thomas Telford Engineering Challenge will get students to practise the kinds of thinking that Telford probably used in order to “come up with this new kind” of longer-span bridge. Following his presentation at the Education Conference of Professional Engineers Ontario this past May (2016), an article about this design challenge was written by a grade 12 Scarborough student from SATEC@W.A.Porter CI. Have a look at the SATEC summer newsletter at http://satecatwaporter.ca/events/uncategorized/summer-newsletter/. 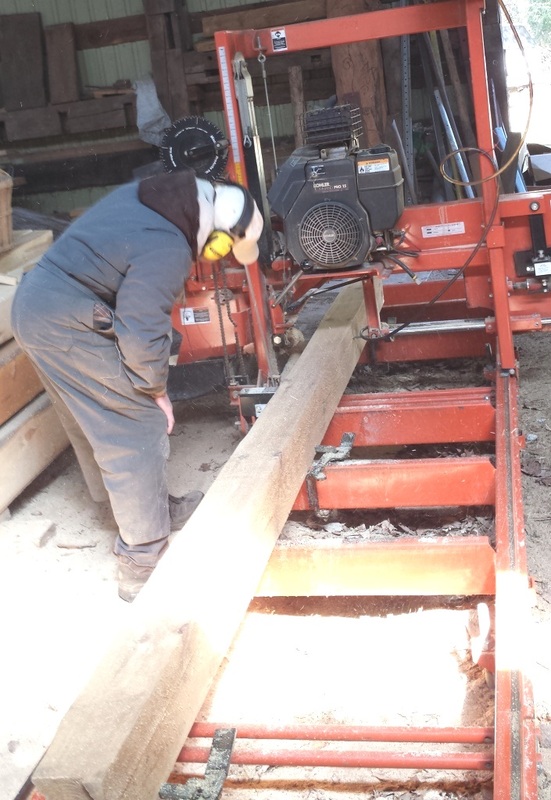 on their WoodMizer portable sawmill -- every piece of the bridge. A load of white pine in the solar kiln. 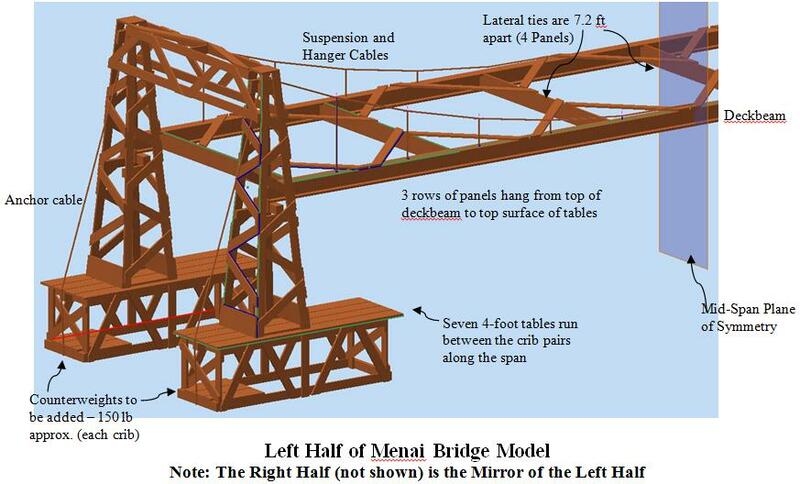 Every piece of wood in the bridge was heat-treated to 150 degrees F for at least 5 hours. with each other and must not compromise strength of the joint. 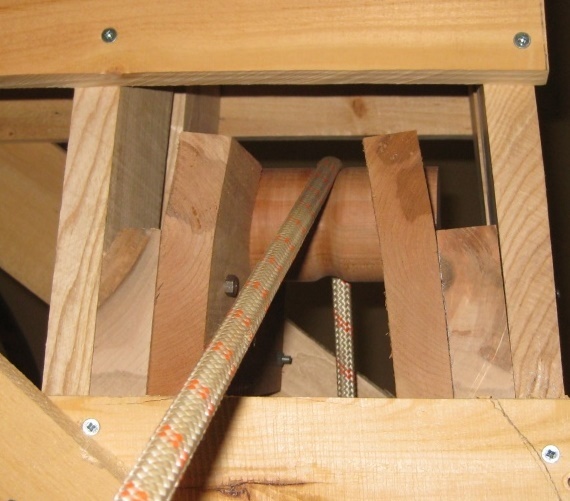 Black Cherry pulley sheave at the top of a tower. 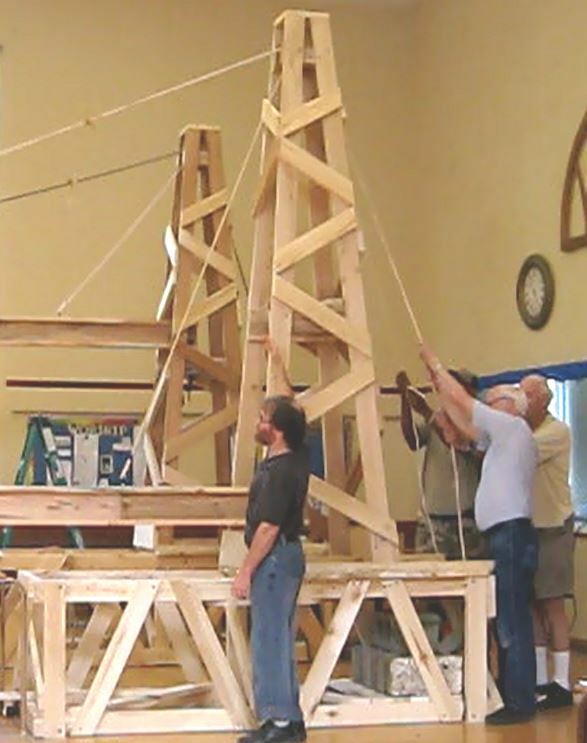 The saddles were cut at the same 4.5o angle as the tower struts. 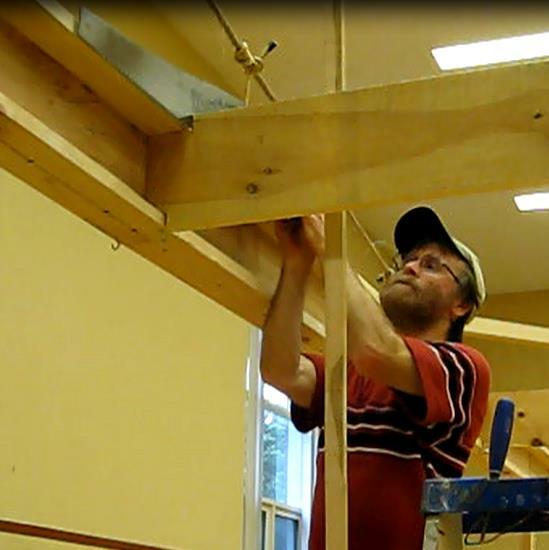 Using some un-dressed (not planed) lumber was unavoidable at times -- time constraints! Each deckbeam was hoisted from three points – the two ends and dead-centre. 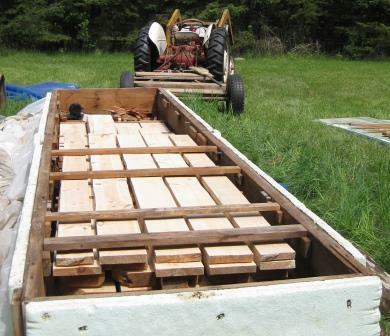 Care was taken to ensure adequate support for the deckbeam all the way up into position. Two braces at the bottom of each tower were re-installed following the hoisting. 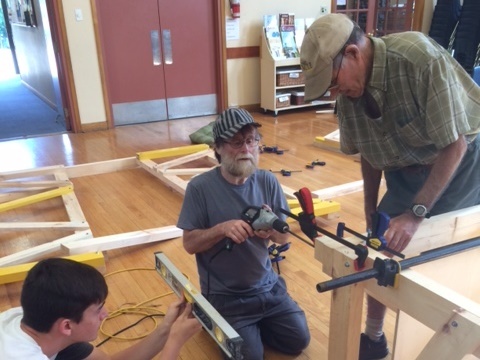 buckling the row of seven church tables which are butted against one another. Notching of the deckbeam lateral ties. two week exhibition at St. Andrew’s Presbyterian Church, Scarborough. 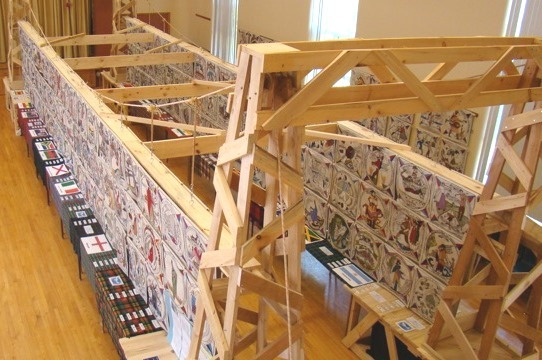 Two hundred and forty panels were hung from the Menai bridge model. Also in recognition of Scotland’s Year of Innovation, Architecture and Design, a special panel by Diane McCowan was added to the exhibition -- Scarborough Scots: Vision, Creativity and Innovation. This panel featured the extraordinary work of James McCowan, Alex McCowan, David A. McCowan and Clark Young.